Jade Ocean Sunny Isles Beach Condo is getting all the attention as one of the most popular oceanfront condos in S. Florida. The all-glass aesthetic design of the building, location, smart home technology installations and various similar innovative ideas brought together at the construction of the building have been focus point for many investors and end-users as well. The appearance of Jade Ocean building is ultra-modern which is one of the things that attracts a large number of potential buyers from Europe, China, South America and Russia. Apart from its outside looks, it is the “smart home technology” that everybody likes when presented a choice of similar condos in Sunny Isles. People who owns a unit in Jade Ocean Condo have access to an in-home touch screen. This screen allows a user to connect with the concierge, valet, find places to shop, control home’s lighting, AC as well as other useful features! You can also download an app on your iPhone or iPad or a table which will allow access to all “smart home” features while you’re away from your apartment. This “future technology” is available for residents of Jade Ocean today! The building offers all desirable amenities – infinity edge pool which spans all around the building and offers great ocean views from the deck. The amazing three-story lobby is also facing the ocean, so when you drive up, you’re also looking at the ocean. 24/7 security, valet services around the clock, private beach club with cabanas, a café, to a splash deck for little ones to enjoy. There is always a demand for a modern, new, oceanfront condo. Sunny Isles Beach offers lots of brand new high-end oceanfront complexes for the most discrete buyer out there. 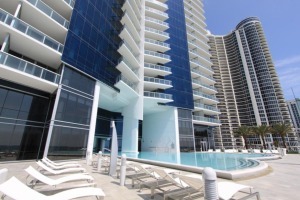 The location is really superb and easy to get to Downtown Miami, South Beach, Design District and even Fort Lauderdale. The interest rates are still low and many Europeans, S. Americans and Russians are buying condos in Sunny Isles Beach. The property values appreciate rapidly, that’s why right now is the perfect time to buy. Besides these few reasons, you will get to see many more things with this Jade Ocean Condo which will attract you to purchase a home here.